The EADS boss who has now also become chief executive of its troubled subsidiary Airbus is a veteran of French industry. Louis Gallois, who only took up the joint top job at EADS in July, is adding the senior position at Airbus to his workload following the departure of former Airbus head Christian Streiff. After Mr Streiff stood down in an apparent dispute with EADS over extra funding to overcome delays to the A380 superjumbo project, Mr Gallois appears to have his work cut out to turn things around. Already suggesting publicly that job cuts appear necessary at Airbus, Mr Gallois will need all his reported diplomacy skills to get Airbus back on track. The 62-year old joined EADS from state railway firm SNCF where he was assumed by some to be nearing retirement. But his move to the top job at EADS was not too much of a surprise. He was already a non-executive director of the European aviation company and therefore knew the workings of the business and its idiosyncratic management structure well. Also in his favour is that he was chief executive of Aerospatiale - one of several companies which merged to form the European Aeronautic Defence and Space Company (EADS) - between 1992 and 1996. Concorde was designed and built at Aerospatiale's Toulouse factory in the 1970s, while this was also where the first Airbus planes were made. In some respects, Mr Gallois' career reads like that of a typical French bureaucrat. He studied at the Ecole National D'Administration, the country's elite college for administrators. He has since held a series of top jobs including running engine maker Snecma, as well as heading Aerospatiale and SNCF. However, it has been his ability to combine strong management skills with a popular touch which has made him valued by politicians from both sides of the spectrum. Despite being a left-wing radical in his youth and working as an aide to a Socialist government in the 1980s, he was appointed head of SNCF by a centre-right administration in 1996. He remained in the job for a decade whichever party was in power, testament to his political as well as administrative skills. During that time, he kept the state-owned firm in decent financial shape while trying to enhance its reputation as a progressive employer. He sought to recruit more women and staff from ethnic minorities while making much of the fact that he made far less than comparable executives in the private sector. 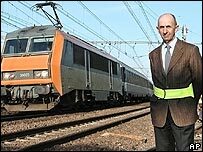 Arnaud Morvan, secretary general of the railworkers union, praised Mr Gallois for his handling of labour relations at the firm. "With him we gained stability, we gained in confidence in our company and to some extent he was able to take the railway workers where he wanted to go, also," he said. However, Mr Gallois is likely to be finding life at EADS very different indeed. He is still at the mercy of political pressures, with the French government owning 15% of EADS and demanding improved management after recent crises at the firm. He may also be finding it a struggle to exert his authority, having to work alongside another co-chief executive, Tom Enders, and two co-chairmen representing the firm's French and German shareholders. Unlike SNCF, Airbus is competing in a fiercely competitive global market where every wrong step has potentially huge financial ramifications. Mr Gallois has acknowledged this, admitting that restoring the company's reputation for good management is a "tall agenda". However, he has the goodwill of politicians who are desperate for Airbus to bounce back from its current woes in its battle with transatlantic rival Boeing. "Louis Gallois is a man of great calibre," French Socialist leader Francois Hollande said back in July. "He has a sense of duty to the state and in this company you also need to talk about a sense of duty to the state and the national interest."